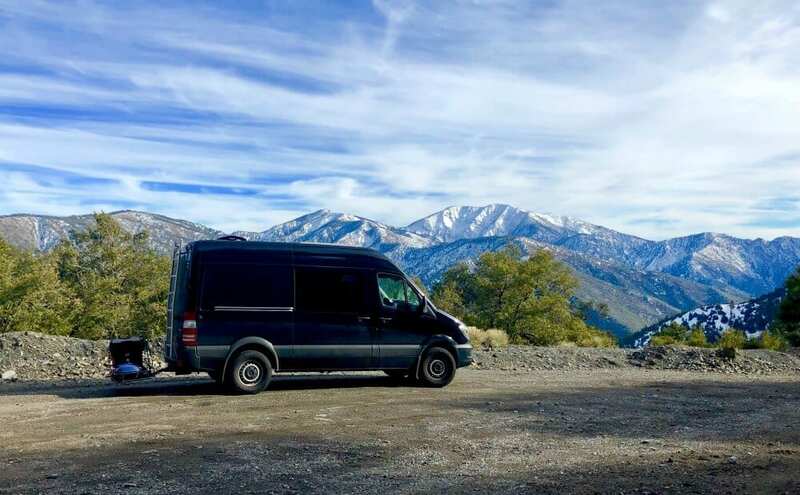 Making the decision to live the van life isn’t the easiest for everyone. 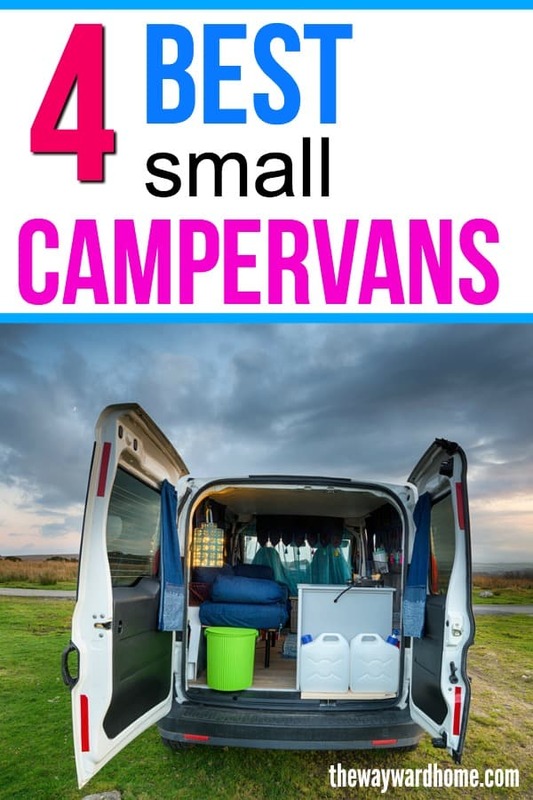 We always see pictures of campervans on Instagram with gorgeous, well-coiffed couples. 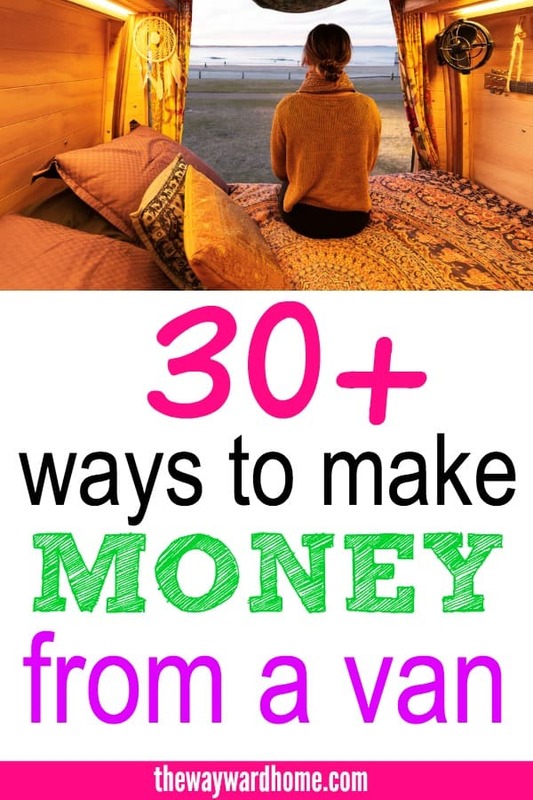 But living in a van is a huge change from living in a house. It’s not the easiest adjustment going to a living space under 100 square feet, and not everyone’s idea of the perfect lifestyle. 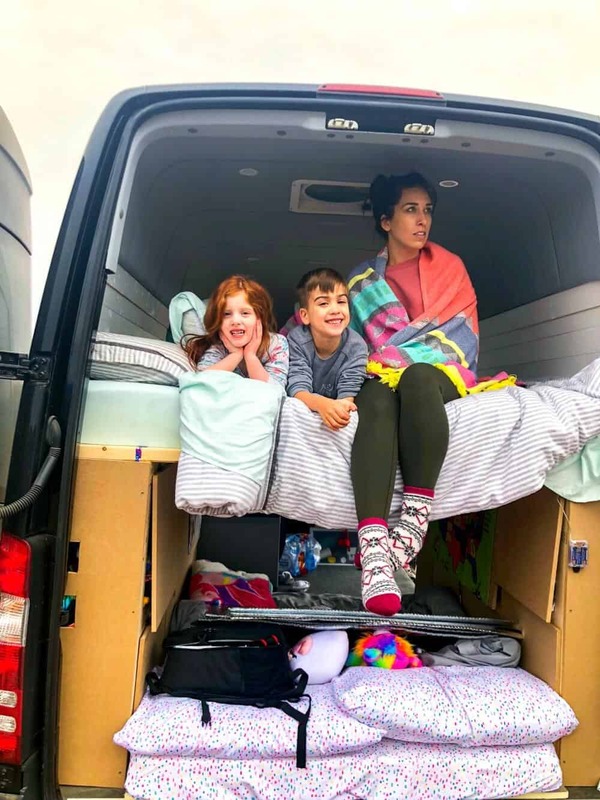 For this post, I asked Jessica Sinclair of Follow that Flamingo to share her journey of downsizing into a Mercedes Sprinter campervan. 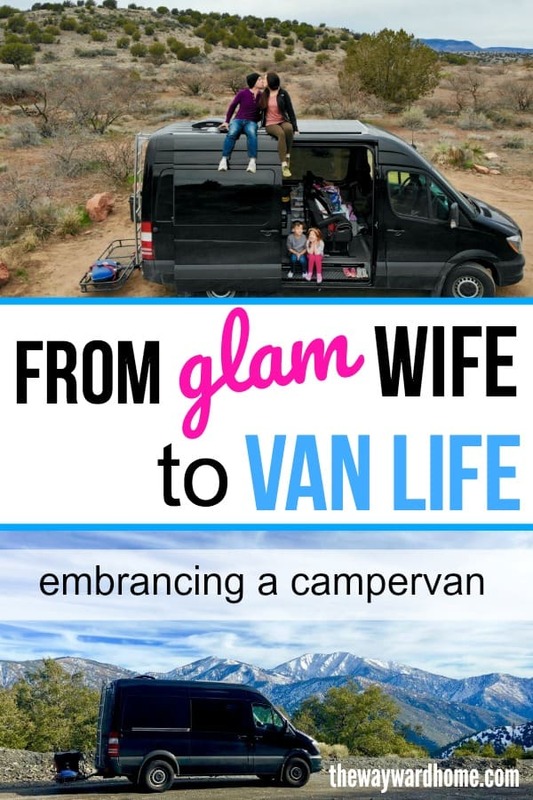 Van life wasn’t something she gravitated toward, but now that she’s finally living it, she’s so thankful she did. 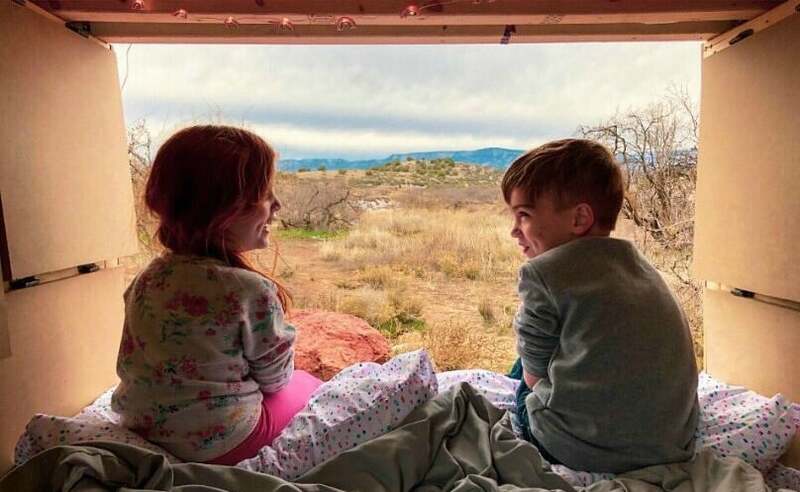 Jessica and her husband Tyler live in a van with their two small children, Jasper, 6, and Briar, 4. 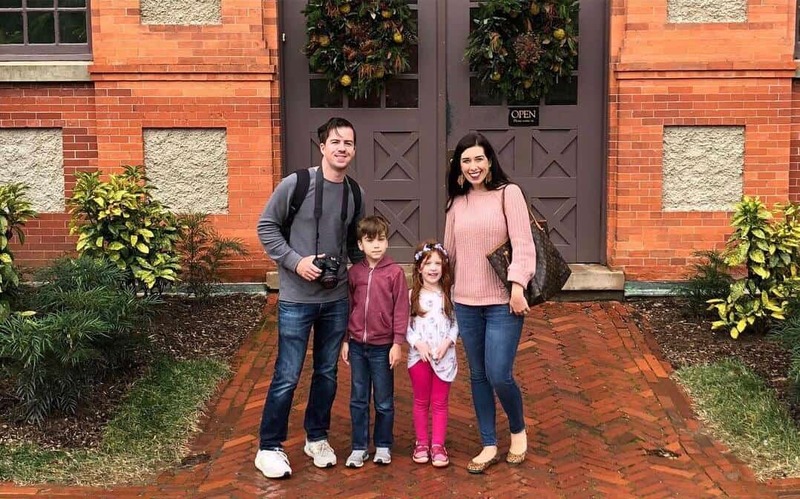 They’ve been traveling for several months and have visited 12 states and 9 national parks. Jessica makes money on the road with network marketing representing a skincare and cosmetics line. I hope you enjoy this honest and inspiring essay from Jessica. When I first met my now-husband, Tyler, we didn’t see eye to eye on how traveling should be done. I was more of the “pack 17x more than you need, ship it over in a crate, and lounge around by the beach for eight days straight”, type. Tyler is more the “if it doesn’t fit in this backpack it’s not coming”…type. So, we could say – polar opposites. Pretty early on, Tyler mentioned that he’d love to convert a van and travel the world in his home on wheels. I can’t even begin to put my initial distaste for this idea into words, but let’s just say I wasn’t a fan. I’m certain that at *least* the first 25 times it was brought up, I promptly shot him down, ending the discussion with a “that’s crazy”. But wait, isn’t she writing this from her van? Yes sir-ee I am, while watching the Winter Storm Warnings roll in for my previous home town. So how did I go from being in the “that’s gonna be a no from me dawg” camp to being a regular overnighter at SoCal rest stops? Ten years have passed since Tyler and I met, and we spent that decade doing what most people do— bought a house, had a few kids, bought a car, accumulated a bit of debt and a whole lot of stuff. Tyler remained set on converting a vehicle into a living space, but I just wasn’t on board with it. I told him this: “Maybe once the kids grow up/once we retire/once we win the lotto/maybe someday, just not NOW”, and put my husband’s biggest dream on the back burner indefinitely. I felt okay with that solution- I mean, that’s fairly common nowadays, right? It’s okay to do this if you’re a grandparent. Grandparents get a little crazy They buy a giant Winnebago and become snowbirds in Florida. They join bridge clubs and get their power walk on in every mall in the country. I’ve got my 2lb weights ready and waiting! The more we talked about it though, the more we wondered: “what if we don’t make it that long?” Whoa, whoa, whoa, lady, you power walked yourself into Downersville. Take it easy! But it’s true. No one lives forever. It’s SO easy to take your dreams and put them in a “someday when the time is right” basket only to look back and realize that your perfect time passed decades ago. The more I considered that, the more I felt we needed to turn up the heat on my husband’s travel dream. Meanwhile, we were tolerating life in central Illinois, where the bugs are heavy and winter is imminent. Starting in mid-October I would wear a blanket around like I belonged in a couture fashion show, waiting for May to show its face. (because, if you’re from the midwest, you know that ‘April showers’ is actually a synonym for ‘spring blizzard’). We would slink around in sleeping bags asking each other “why do we live here?”. It started off as a joke, but the more we wondered it out loud, the more serious it became. Why DID we stay, year after year? For several years we convinced ourselves it was a money thing. We can’t just quit our jobs and live off the land! That’s ludicrous! Truthfully, my job can be done anywhere, so that was a very lousy excuse. And Tyler, sensing that I was being worn down on my “someday” vibes, showed me just how much money we were spending—mortgage, cars (we had 4 at one point. FOUR! ), household bills, property taxes, Target runs, etc and we realized we were dumping so much money into unnecessary items and into a place we didn’t even love. Why?! Deep down I knew the answer: because change is scary and it’s easier to just keep doing the thing you’re doing. It’s easy to say “someday” or “that sounds good for THEM but we could never make it work” or “I can’t because <insert not valid reason here>”. It’s easier to look at all the reasons why it won’t work and call it a day instead of putting in the work to come up with a way to make it happen. So after a bit of convincing and an ambitious dose of “ya know what? Why not!! !”, that’s what we did. Our plan included a Sprinter camper van pretty early on, mainly because that was always part of Tyler’s vision, and because we couldn’t afford a big RV. He’s ridiculously handy and was able to build the entire thing himself, so we saved quite a bit of money with that. 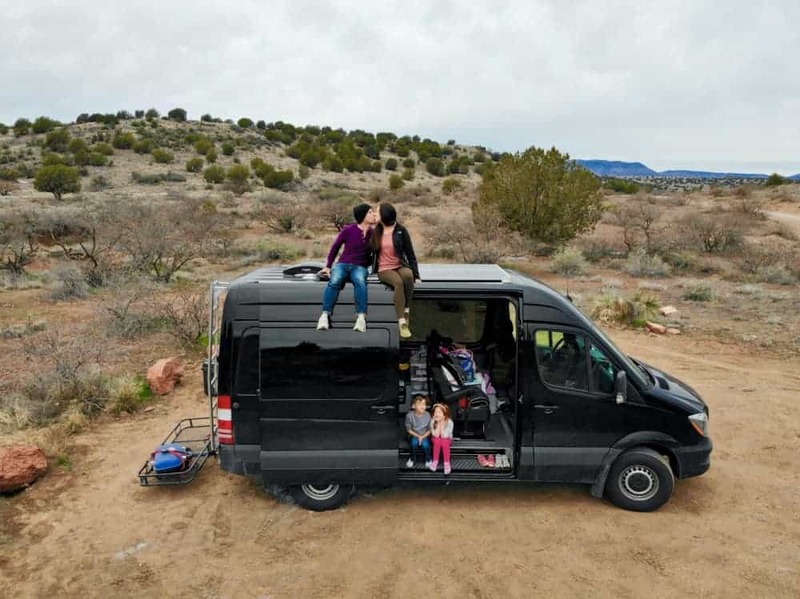 Here was the main problem in my eyes: we would be going from a 2,000-square foot house filled with junk drawers and stuffed closets to living in a van with 72-square feet of living space. Guys, I have said this time and time again. I am not a minimalist. I like my things. I love having options for pretty much everything, even if I never actually utilize them. I remember staring at my walk-in closet, thinking there was no way I could ever choose what to pack, keep, or get rid of. How do people live with only a few pairs of shoes!? And this was true for many other “stuff collections” in our house, too—vases, birthday party supply stashes for parties we NEVER threw, books that I bought solely for decoration on a bookshelf, a very unimpressive bag of cords— all of it. At first, I almost felt victimized that I would have to sort through and decide what was worth keeping and what wasn’t. It was overwhelming and something I really tried very hard to avoid. I sat in a pile of pants, initially refusing to get rid of any of them, even though the honest truth was that I hated how they all fit, looked, or felt, and never wore any of them. But then I realized: I was choosing the satisfaction of a full pants shelf over the joy of being able to go wherever I wanted. I valued bags of balloons and gift bags more than I valued freedom in our schedule. By not allowing myself to let go of these things, I was basically saying I would rather look at a well-curated bookshelf than a Pacific Coast sunset. Once I had that revelation, it was on! The negative wasn’t having to let go of things, the negative was how much holding on to it all was holding us back. The reward was gaining stories to tell over stuff to show, and giving our kids (and ourselves) an experience most only ever talk about doing someday. We’ve been on the road for a few months now. I will admit there is definitely a learning curve to making it work. It involves teamwork and patience and rolling with the punches sometimes (3 things I have never once been accused of being good at, but I’m learning). Just like anything worth having, it takes work to make it, well, work. While some days are better than others, every day in the van has been infinitely more interesting and soul-filling than the monotony of ‘normal everyday life’ back home. 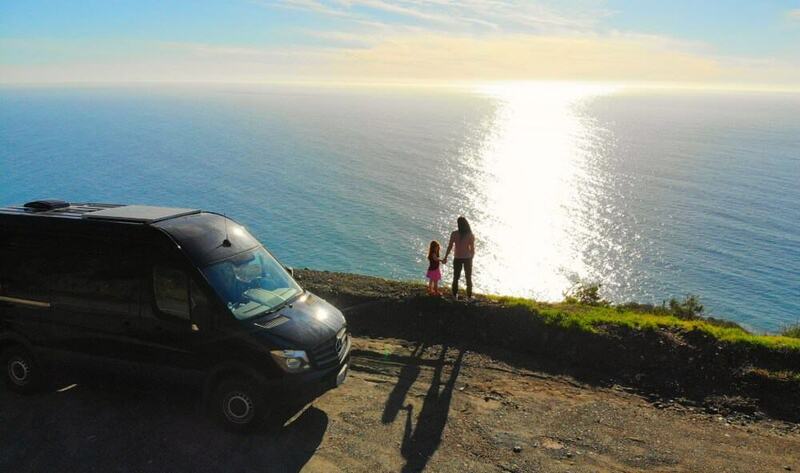 We’ve taken our van from sea to shining sea and are working on everywhere in between as I type. We’ve had more family time and less screen time. We traded hills of dishes for mountain ranges. We’ve spent rainy days snuggled up as a family, when a rainy day at home used to make me feel trapped. There are still days I wake up and think “this is crazy!”, but it means something a little different than it used to. Our lives are filled with so much MORE, even though we have less. Downgrading our living space was the best thing for our family, even if it took me 10 years to see it.